Few things fire up the imagination like lost treasure, buried away just waiting to be found. We take a look at four gold hordes that people continue to look for to this day. A fleet of twelve Spanish ships was en route to Spain from the New World when a catastrophic hurricane hit. Only one ship survived. The other eleven sank off the eastern coast of Florida. Each carried immense wealth. However, one, in particular, carried the motherload. The San Miguel is considered by many to be one of the most valuable treasure galleons ever lost. To this day, treasures from this ship and others from the fleet wash up on Florida beaches. In September of 2013, one lucky family found $300,000 worth of gold less than 200 yards offshore. The total value of the San Miguel and other ships is well into the hundreds of millions and people continue to search the seas for the fortune. Nothing changes one’s perspective like a terminal diagnosis. In 1988, art dealer Forrest Fenn learned that he had cancer. Doctors told him he had less than two years to live. This ticking clock inspired him to bury $1 million of his wealth. He encouraged treasure hunters to find the horde and even provided cryptic clues. He wrote a poem with confusing lines like, “Begin it where warm waters halt And take it in the canyon down, Not far, but too far to walk.” Though the idea came to him after his diagnosis, he buried the treasure twenty years later after beating the illness. No one has found the stash though Fenn claims some seekers have come as close as 200 feet to the site. Fortune hunters be warned: two people have died searching for Fenn’s legacy. 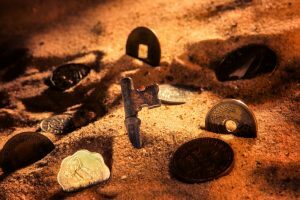 Some gold hunters believe the Southern Rocky Mountains of New Mexico are hiding millions in god buried within a collapsed mine shaft. The story begins with Milton Ernest “Doc” Noss. He was on a deer hunting trip when he made the find. Liberating the treasure proved difficult. There was only one way out of the mine, and the opening was too narrow to effectively remove the gold. Foolishly, the “Doc” decided to use dynamite to blast a larger opening. This attempt, unsurprisingly, collapsed the entrance sealing the riches away. Doc Noss lived only a few years more; an associate shot him amid a dispute. Thought the Noss family continued to press for access the US government stepped in taking control of the area for use as a nuclear testing site. Officials claim they never found Noss’s alleged gold. To this day we don’t know who is telling the truth. The life of a crime boss is hard. Dutch Shultz was a New York Mobster living large in the 1920s and 1930s. He made a fortune bootlegging and conducting organized crime. It wasn’t long, however, before the tax man came knocking. Eventually, he was indicted by a Grand Jury. He arranged for a professional to build a special watertight safe in which he stashed $7 million to keep away from other mobsters and the Federal Government. He hid it in the Catskill Mountains with the intention to retrieve it later in life. Schultz was eventually shot and killed. Many believe his fortune remains buried. Find it, and it’s yours.